People born specifically on the 14th of September are believed to be independent and intelligent with the usual Virgo generosity and need to be appreciated. The ruling astrological planet chosen for this particular day is Mercury, the same celestial authority that rules your zodiac sign giving you extra charm and vision. If you have this birthday, articulate and full of innovative ideas you usually like analyzing and putting things into categories. Assertive and ambitious you are naturally enthusiastic about life and easily motivated into action. Your adventurous inquiring mind requires lots of mental stimulation but is not so expressive emotionally and may be also idealistic and over critical too. Individuals with a September the fourteenth birthday are highly observant, moralistic and thoughtful with a dislike of injustice. Although sometimes your manner is overly fussy, inflexible and skeptical you are inclined to be incredibly loving, compassionate and sincere towards others. The abundance of natural talents attributed to a person born on the fourteenth of September makes work options fairly unlimited. Once you discover a personally satisfying profession you are inclined to be totally dedicated to your job and loyal to your employer. You may often contemplate some form of self employment yet it is rare for you to actually do it. Despite this hesitancy to be your own boss you are especially adept at utilizing your inventive concepts and finances in order to generate reliable extra income streams. You have a keen eye for a bargain in addition to the patience to save for larger purchases. For a Virgo, the person born on the fourteenth day of September is typically craving of warmth and togetherness yet often held back by a slight emotional distance. You are usually much better at expressing your loving thoughts than showing affection. An ideal partner will be able to calm your criticism and fear of revealing and demonstrating your true emotions. Quite family orientated, practical, steadfast and loyal, you are likely to be very caring and committed to a soul mate. Your attention to detail makes you receptive, attentive and romantic in a long term settled relationship. More open and uninhibited than other Virgo's in the bedroom you are imaginative and enjoy sharing fantasies as a turn on. A tendency to dwell on the past could make forgiveness of a love betrayal particularly difficult and emotional unhappiness causes you to be irritable and moody. The usual fine health experienced by those born on September 14th is on some occasions disturbed by your proneness to easily get stressed. A bit of a preoccupation with healthiness and touch of anxiety can once in a while drain your energies causing fatigue and moodiness as well as possibly lowering your resistance to illness. In spite of your sensible food preferences and favor of a varied diet you sometimes do not eat as much as you should. A reliance on caffeinated beverages to fill up and keep alert is a susceptibility. People born on this day could avoid workaholic burnouts if they ensure they get enough relaxation and sleep. Your main strengths of character are best exposed in your admirable mixture of effective and efficient independence and intelligence. These finest fortes are enhanced and assisted by your other positive traits of perceptive alertness, curiosity level and keen sense of adventure. All these fantastic attributes help you ordinarily direct your energy positively and so be destined to do fairly well in life. Negativity is frequently responsible for activating the personality weaknesses for those born on September 14th. These negative tendencies include occasional fussiness, inflexibility, impatience and doubting or critical behaviors. Being born on the 14th of September means you are a bit of a perfectionist who is likely to have plenty of aspirations. As your usual high standards guide you to want to do things properly meaning you are often very disappointed with yourself if you fail in something. Your eager motivation encourages you to set goals based on a desire to achieve you full potential. One common desired aim is to find a harmonious balance of time for both your work and home priorities. Dreams are times you tend to reserve for fantasizing where you envisage a fairer world for everyone with more freedoms and less restrictions. As you were born on the fourteenth day of the month the one and four in your birth date add up to a Root number of Five. This numerical reference to your birthday has the keyword 'Inquiry' reflecting your intense curious observancy and need for stimulating surroundings and distractions. In the Major Arcana Tarot the 14th card illustrating Temperance is associated with your birthday. This is an indication of your strivings for flowing harmony and emotional stability. The luckiest gem selected for September the fourteenth birthdays is a Diamond, wear this precious stone for increasing positivity and favorable fortunes. The typified descriptions of the probabilities of Virgoan personalities are arrived at from the assumed influence of the planet Mercury's dominance. 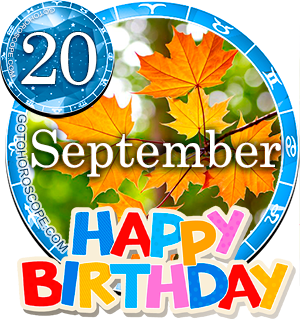 The actual day you were born on, the fourteenth of September, is also governed by Mercurial power astrologically. Therefore this celestial body is thought mainly accountable for your individuality. Your charming assertiveness and virtuous conduct intensify your helpfulness, kindness and understanding. Your visionary clear expression and ability to analyze and categorize effectively gives you a spirited approach and optimistic outlook. If you can find methods to try and neutralize negative vibes you should be less doubtful, fault finding, obstinate and finicky. A culminating thought for people born on September the 14th is to try and keep your opinions to yourself as voicing them can every now and then be disadvantageous. O m f g. Same as some of the above. It describes me perfectly. omg everything about this text is true omg I cant get over it !!! Born on sept 14th. Horoscope give very accurate description of my personality. Gosh - that's me alright! THIS IS MY OIFE ITS VERY ACCURATE!! 100% me as well. So true. This is really amazing..i wonder hw can someone knw me so perfectly..
my name is dave. I am sad and depressed. I want to be a millionaire but I will never ever get there. Help. I'm a Christian, and was taught not to believe in these things, but it's very accurate.. Some what me but I am not assertive. But life has been hard for me for the last 5 years and hope it all get better. Wow... It's crazy how accurate this thing is! I love my birthday and being a Virgo! That reminds me... Our birthday is in a couple of weeks! This is 99% me, how come u know me too well? This SPOT-ON. It's nice to "meet" myself. This entire thing was so scarily accurate. I'm amazed.